Discover marketing techniques to grow your business to heights you never believed possible. Couple expert advice and marketing philosophy with techniques proven to help entrepreneurs increase revenue and you will be well on your way to turning your business aspirations into a multimillion-dollar cash machine. Get inspired by stories of ordinary business people who have achieved extraordinary results. You will hear the story of amazing persistence from the founders of the Chicken Soup for the Soul franchise. You will also learn cutting-edge online-marketing techniques from Internet marketing guru Alex Mandossian. Then let John Assaraf take you on his journey of visualization and discover how you can use this powerful technique in your own business. Several members of this expert faculty have generated billions of dollars in sales using these success techniques from the online shopping industry to infomercial success. 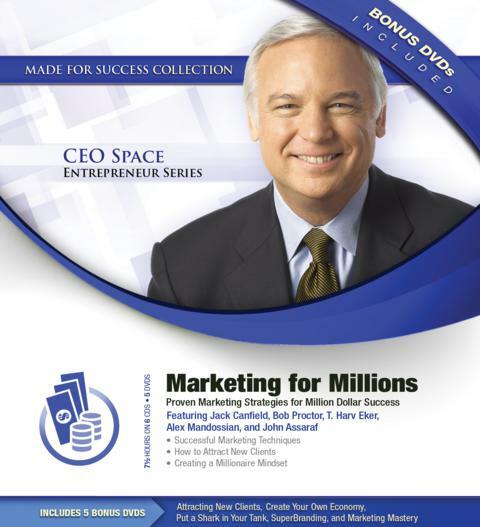 Learn marketing success from the absolute best in the world and take your business into the stratosphere.